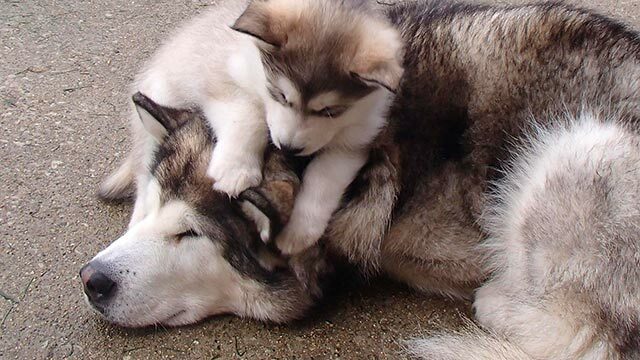 The BEST way to find the right Alaskan Malamute puppy for your family is thru a responsible breeder. Responsible breeders take their dogs and breeding quite seriously, and work very hard to assure proper placement of their puppies to homes they feel are good ones. If you choose a responsible breeder… this means you can consult with them about grooming, veterinary care, health issues, training, exercise, diet and any other dog questions you may have. If there are any problems, your breeder will be willing to work with you. In your search for your new puppy, be sure to speak with, visit and consult with several breeders. A quality breeder will provide you with a contract that will state your responsibilities as well as theirs. It will outline their guarantees and any requirements of you as the new puppy owner. Contrary to public opinion, puppies that are purchased from responsible breeders, will most always be less expensive than those from pet shops or puppy farms. One who will take the puppy back if the owners can’t keep it, or help and assist finding a home for the dog. One who breeds for the betterment of the breed, not for making money. For the betterment of the breed means breeding to the AKC standard, using healthy breeding dogs, proving them in some area (show ring, working, performance events like obedience and agility), and trying to breed for that elusive ‘perfect dog’. Betterment of the breed is not breeding for a particular size, for long hair, or for a certain color. One who will often be a member of the national breed club (Alaskan Malamute Club of America) and/or their local breed club. They will care about the future of the breed as a whole. Members of AMCA agree to the club’s code of ethics. One who will not mind you asking for references and will refer you to another reputable breeder as well as help educate and aid you in finding that perfect puppy for your family. One who does proper health clearances – hips, eyes, Chrondrodysplasia certification thru the National Club. They will have had all puppies veterinarian checked, as well as proper worming, shots and records including certification certificates and numbers on the parents of the litter. Encourages continued contact with the new puppy parents for any concerns, questions through the puppies life. A quality breeder often has a long wait list. Don’t be put off by this. They also will require a deposit; this is common practice A quality breeder does not have a lot of litters, so the demand is usually greater than the “supply” -patience is a virtue! Avoid anyone saying they have ‘rare’ anything. Red malamutes are not rare, neither are white or long coated malamutes. Beware if you see anything referred to as “rare”. Malamutes do not have blue eyes. It is a disqualification. Blue eyes means there’s a Siberian Husky in there somewhere. Remember: “Rare” = gimmick to sell puppies. Look at the condition of the dogs in the photographs. Are they cleaned? Well groomed? Do they look healthy or are their coats looking a bit dull? Dull coats can indicate thyroid problems or dirty conditions. Coat is one of the first indicators that there is a problem. How are they kept? Do the dogs look healthy or are they scrawny and lack definition to their bodies? Are they fat and their stomachs hang? Do they look happy? The occasional cute picture of a muddy dog caught digging is fine; if most of the pictures on the website show dirty dogs it is not. Is a pedigree listed? Commonly disreputable breeders will list a few famous kennels that appear behind their dogs, often it’s one or two dogs in the 5th or 6th generation of the pedigree. That can be very common in most dogs. It’s not a sign of quality! Be leery of sites listing their methods of payment and prices. Disreputable breeders often list both; it’s clear what is most important to them! Run, run away from kennels advertising that the pups are sold “As Is”. Clearly they do not stand behind the health of their puppies. Breeders who care will ask questions about your experience with the breed, your home situation, and may even request to do a home visit so they know their pup is going to the proper home. Many quality breeders will have you fill out a questionnaire, because it is important to place the correct puppy with your family. They will have spent time with the puppies and know which ones have the right personality for you. A good breeder won’t sell a puppy to just anyone. The puppy’s best interests are #1! Are there multiple breeds of dog on the property? Breeding is a passion and learning pedigrees is very time consuming….but reputable breeders enjoy searching for the right combination. It’s possible to be quite knowledgeable in a couple breeds at the same time but if a kennel is breeding more than a couple breeds, it’s highly improbable that proper research is being done and most likely it’s a puppy mill. Avoid kennels who publicly bash other specific breeders. Or better, the ones who say “mind your own business” or protest on the website that they are not a puppy mill. If they feel the need to say it…that should raise some warning flags. Reality – As much as we wish they were all Best In Show winners, in every litter there are dogs who are not destined to be show dogs. That doesn’t mean they aren’t EXCELLENT as pets, obedience, agility or working dogs. Reality – Malamutes are not meant to be 150#’s. If you want something of this size you need to reconsider your selection of breed. Newfoundland, Great Pyranese, St Bernards are just a few that would better serve you if you want such a large dog. The average weight for a malamute is 60-100#. Reality – Look for the certifications! Hips: OFA – www.offa.org PennHIP – research.vet.upenn.edu/pennhip/ Eyes: CERF – http://www.vmdb.org/cerf.html Thyroid: OFA www.offa.org Elbows: OFA www.offa.org Cardiac: OFA www.offa.org Dwarfism: Please see the information about dwarfism available on the AMCA website.